This cocktail—I hesitate to call it a margarita, though I think it was under that heading in the restaurant’s drink list—is made with Milagro silver tequila, Licor 43, and red grapefruit, orange, and lime juices. A paloma, I’ve just learned, is a popular Mexican cocktail made with tequila, grapefruit soda (or juice and club soda) and lime. I really enjoy the flavors: the grapefruit, Licor 43, and tequila complement each other very well—even heavenly so. The grapefruit does lend sourness, but the sweetness of the orange really mellows it out as the drink lingers on your tongue. 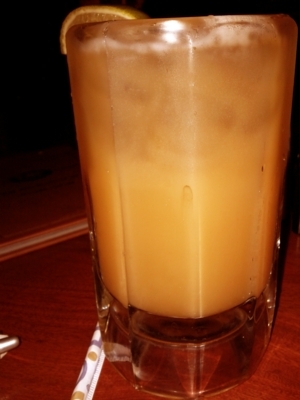 It’s close to a mai tai in flavor, but this is a good drink in its own right. It makes me smile when I take a sip.